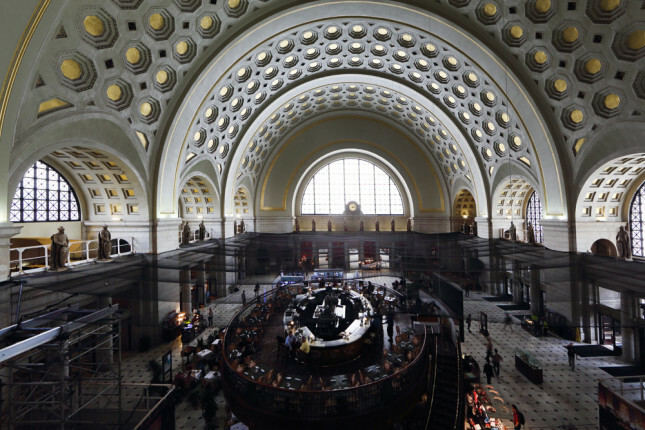 Frequent visitors to Washington’s Union Station may notice on their next trip that something is missing. For the first time in half a century, managers say, the Main Hall of Daniel Burnham’s Beaux Arts train station is free of all construction-related scaffolding and other obstructions and can be viewed as the architect intended. For once, in other words, there is no major repair work underway, no blocked-off construction zones to walk around to get to the train. Also missing are the Center Café and two indoor planters that were added in previous renovations and took up much of the space under the barrel-vaulted ceiling. Scaffolding went up after a 5.8-magnitude earthquake shook the region in 2011, damaging the train station and other historic structures. Besides replastering the coffered ceiling, contractors introduced a new “seismically sound” support structure for the ceiling and improved the heating and air conditioning systems in the attic. Before that was a series of modifications designed to make the station more of a destination for residents and travelers, including a National Visitor Center timed with the nation’s Bicentennial in 1976 and subsequent plans to make it a festival marketplace. Part of the just-completed restoration involved removal of a large café and round planters in the center of the Main Hall, a move that represented the culmination of several years of discussions between the Federal Railroad Administration and the State Historic Preservation Office. The Center Café closed on March 1, and removal of the restaurant enclosure and planters began soon afterwards, opening up the Main Hall. The Main Hall opened in 1907 as the General Waiting Room for the station and was known for its impressive scale. It measures 219 feet by 120 feet, and its gold-coffered ceiling is 96 feet high. Lined with mahogany benches, the Main Hall functioned as a large open space until the 1940s, when World War II brought an increase in passenger traffic and ticket counters were expanded from the West Hall into the Main Hall to meet demand. In the 1970s, as train travel declined and air travel became more popular, managers considered new ideas to keep the station active. They designated the train station a National Visitor Center in honor of the nation’s Bicentennial. The Main Hall was reconfigured to contain an elaborate slide show that featured scenes of Washington and other tourist attractions. The slide show proved unpopular and was closed in 1985. That same year, the entire station was shut down for a renovation that included the Center Café prominently positioned in the center of the Main Hall, and other stores and restaurants nearby to make more of a hub for shopping and entertainment. The August 2011 earthquake provided an opportunity to rethink the station again. Besides causing damage that required immediate attention, it triggered a larger discussion about the best way to preserve and restore the Main Hall. In 2012, contractors began restoration of the damaged ceiling. As part of the work, they installed an elaborate system of steel framing to provide a new support structure for the ceiling, designed to help protect it in case of future earthquakes. The entire ceiling bay was also repainted and new gold leafing was applied, with help from the National Trust for Historic Preservation and a $350,000 corporate donation from the American Express Foundation. The grant helped repair the ceiling by aiding in the replacement of more than the 120,000 sheets of 23-karat gold leaf. Besides the repair work on the ceiling itself, the heating and air-conditioning systems in the attic, behind the ceiling, were improved by realigning ductwork and creating new connections to the ceiling diffusers that will allow them to be cleaned and serviced more regularly. In April, once the ceiling restoration was completed, deconstruction began on the Center Café and the two circular planters, which once served as fountains. Swaim-Staley said the last four years’ worth of repairs were a team effort, involving the Federal Railroad Administration; Union Station Investco, an entity of Ashkenazy Acquisition Corporation, (manager of the station’s retail spaces); the State Historic Preservation Office, and other historic agencies. London-based Hayles and Howe led the plaster ceiling restoration. Preservationists say they’re glad to know the work is done. 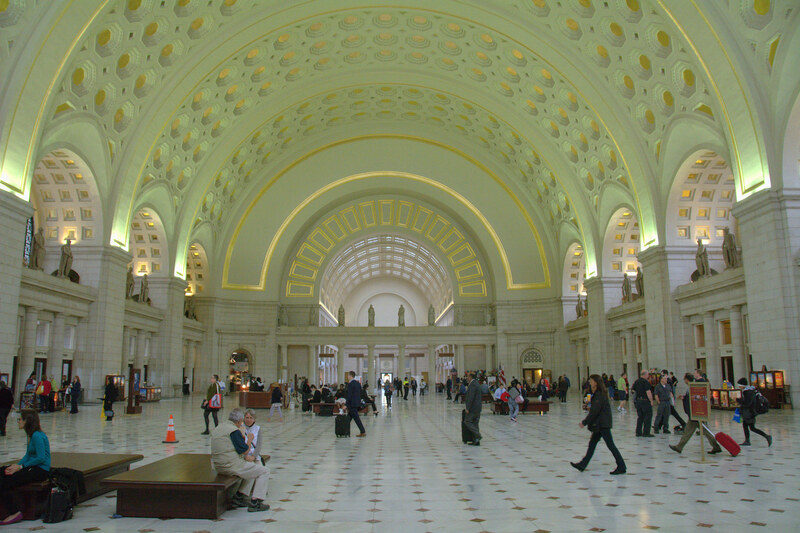 D.C. Union Station Historic Preservation National Trust for Historic Preservation Washington, D.C.